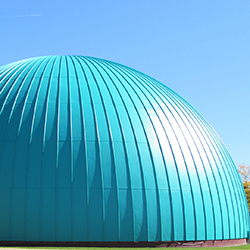 Visit Michigan’s largest planetarium, located at 1310 E. Kearsley St. Flint, MI 48503. Longway Planetarium presents educational and entertaining shows exploring astronomy and science topics every day of the week! Effective August 8, 2018: Genesee County Residents now receive 50% off admission to shows at Longway Planetarium, provided by the Arts & Culture Millage. Please present your driver’s license or ID with your address on it to receive your discount. Click here to view complete show times. Monday-Wednesday 10 a.m.- 5 p.m.
Thursday & Friday 10 a.m.- 9 p.m.
Saturday 11:30 a.m.- 9 p.m.
*Please present your driver’s license or ID with your address on it to receive your discount. Members must show both their membership card as well photo ID to received member discounts. If the member card isn't available, we can find the membership with the photo ID. Get all the details about upcoming activities and events, including First Friday talks and Second Saturday Trivia Nights. Follow the adventures of Sy, Annie, and their dog Armstrong as they embark on an unexpected journey into space! This show explores the state of the Arctic today, the crucial role that ice plays in the northern environment, and the changes that are quickly overtaking the people and animals who have adapted to this land of ice and snow. Imagine the ultimate space vacation! Discover our solar system through a new set of eyes – a family from another star system seeking the perfect vacation spot. Longway Planetarium’s astronomy experts take you on a tour of the night sky over Michigan in this live planetarium lecture. Experience 10 of Queen’s greatest hits, including favorites like "Bohemian Rhapsody," "Another One Bites The Dust," and "You’re My Best Friend."